What is the perfect work that patience performs in us? How can it help transform us from everyday people to being Christ-like? Can patience work in us to have an attitude of wanting nothing? The development of our character is dependent on its proper application. Let's look at patience from a human standpoint and try to identify how life with and without patience has an effect on us. The definition of patience is the capacity to accept or tolerate delay, trouble or suffering without getting angry or upset. Impatience often manifests itself in a feeling of anxiety and discomfort. Negative thoughts enter our mind and can cause us to become frustrated when we think someone or something is not acting quickly enough; or we become annoyed because we cannot wait for the completion of something that we assess as simple or easy; we may become frustrated because we cannot believe anyone would lack care and concern, thinking only of themselves and acting as such, causing delay of an outcome or danger in an action that puts others at risk. We might ask questions such as, "Why are they doing that? What are they doing? Don't they get it?" Impatience also can manifest itself in our attitude when something we desire is not being made readily available. Our mind searches for someone or something to blame for our initial feelings of anger or frustration. Have you ever had your computer printer jam and yell out something like "stupid printer!" ? 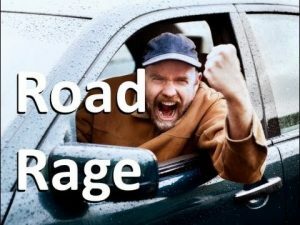 Have you become irritated while waiting in the left turn lane and the signal turns green but the people in front of you do not move? Do you get upset and rail against them? Patience has the thought of having self-discipline—not for just a few minutes, but ongoing. This is a very desirable quality, especially as followers of Jesus, because we should always be thinking about how to improve our characters. However, actually developing this quality in its fullest sense can be very difficult to achieve. The Apostle Paul gives us sound advice in 2 Timothy 3:1-4, where he identifies what conditions would be like in the last days…in our day. He tells us that men would be "lovers of themselves, boasters, proud, blasphemers, heady, unthankful, denying the power of God." He then contrasts that lifestyle with his own in verse 10: "But thou hast fully known my doctrine, manner of life, purpose, faith, longsuffering, charity, patience..." He points out that evil men will grow worse and worse. He says in verse 12 "all that will live godly in Christ Jesus will suffer persecution." Indeed, the quality of patience in the present day is absolutely necessary to counteract what we see occurring around us that brings anxiety, frustration and feelings of anger. In Paul's description of his character he uses both the words longsuffering and patience. There is a difference. Longsuffering means having or showing patience in spite of troubles, especially those caused by other people. It is translated from the original Greek word makrothunia. 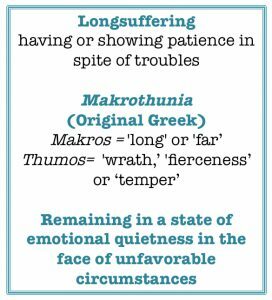 Makrothunia is made up of the Greek words makros (meaning 'long' or 'far') and thumos (meaning 'wrath' or 'fierceness'). Although thumos can mean wrath or fierceness, its usage in this compound form carries the idea of 'temper.' Thus, makrothunia denotes remaining in a state of emotional quietness in the face of unfavorable circumstances. Now let's look at the word patience. 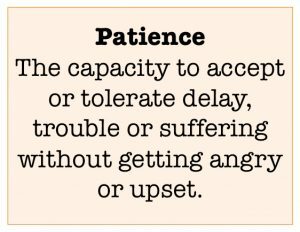 We mentioned earlier that patience is the capacity to accept or tolerate delay, trouble, or suffering without getting angry or upset. It was translated from the Greek word hypomone which is a compound word made up of two other words: hypo, a preposition meaning 'under,' and moneo, a verb meaning to 'remain' or 'abide.' Thus, the idea is to 'remain under' or 'abide under' difficult circumstances, as when it is not possible to escape or avoid them. 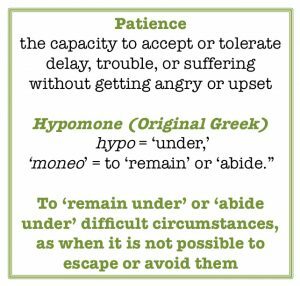 A Christian writer, Charles T. Russell, once wrote, "hypomone, the Greek word translated patience, has a much deeper and fuller significance than the rather easily understood straightforward definition for patience. There is the thought of constancy, enduring, remaining under. Therefore patience is not just a temporary condition or restraint of feeling or action—it becomes part of you, an element of character that helps define your being." Let's say you get cut off by an insensitive, inconsiderate driver on the freeway. You may instantly react very negatively but then regain your composure. A higher form of patience would be to endure the wrong with contentment and without rebellion. Why? 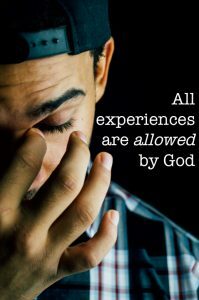 Because all experiences are allowed by God. When we endure without rebellion, we are replacing the desire to blame someone or something for our frustration with the thought that the experience is beneficial to our character or our new mind and heart that is devoted to doing God's will. This acceptance with patience of unjust or difficult experiences is a reflection of the degree of our faith and our ability to keep control over the desires of the mind. To gain such patience, such control, is a lifetime work. In a sense, we must use patience over and over to become patient. A character acceptable to the Lord takes time and is fashioned by the bumps and bruises, the successes and failures, and the acceptance of the experiences directed by the Lord that occur throughout our entire lives. These test our constancy of desire to do right as well as prove our devotion, submissiveness and compliance with our Lord's direction. Enduring experiences out of duty in an annoyed, dissatisfied manner goes against the thought of patient endurance where we are to delight to do God's will. If the Father prepares, directs and allows different experiences in our lives, we are to accept these by faith without complaining. Indeed, this ability is accomplished only with time and practice. Noah prepared the ark and waited 120 years after the Lord instructed him to build the ark before the floodwaters actually engulfed the earth. Hebrews 11:7 tells us the world condemned him, yet his reverence for the Lord kept his faith alive. Noah was patient, and his patience paid off, for he and his family were saved. God promised Abraham he would be the father of many nations in Genesis 12:1-3. But years went by and no child was in sight. Even though God restated His promise to Abraham through the years, time moved on without a child. Abraham and Sarah finally had their own son when they were 100 and 90 years old, respectively, and received the promise of God. Hebrews 6:15 says, speaking of Abraham, "And so, after he had patiently endured, he obtained the promise." The lesson for us is that after we patiently endure we receive the fulfillment of the promise. Joseph was sold as a slave, yet he trusted God and patiently fulfilled each situation and duty he found himself in. God lifted Joseph up to great power, as Joseph's dreams as a boy predicted, and he became a leader where others bowed before him. Enduring patience again provided successful results. Job knew God had a plan and was willing to accept what God allowed in his life. In the end, God restored to Job twice as much as he had in the beginning (Job 42:10). Again there is a lesson for us: Job patiently persevered and received a great reward. We are to do likewise. There i s a story about a little girl who visited a farm one day and asked to buy a large watermelon. "That big one you got in your hands costs 3 dollars," said the farmer. "I've got only 30 cents," replied the girl. "30 cents will buy you a small watermelon," barked the farmer. "How about that one?" 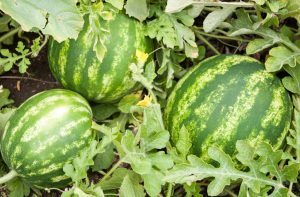 the farmer asked pointing to a small watermelon in the field. "Okay, I'll take it," smiled the little girl. "Here's your 30 cents, but leave it on the vine. I'll be back for it in a month." The little girl was pretty smart. She knew her patience would be rewarded. By waiting one month, she could have a big, ripe watermelon for the price of a little green one. Not only can we be impatient with our fellow man, it is even possible we can be impatient with our Heavenly Father, too. Sometimes we wait for a need to be met: should I look for a new job? Or sometimes we wait for an answer to a question: should I pursue a particular education? Sometimes we wait for God to fulfill a promise, provide comfort during a trial, or give assurance we are on the right course. Psalm 10:1 reads "Why standest thou afar off, O LORD? Why hidest thou thyself in times of trouble?" 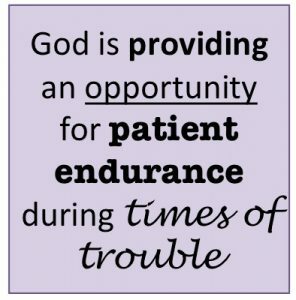 The answer is He is providing opportunity for patient endurance. Why is patience with others so difficult? We can sometimes tell ourselves that other people think only of themselves, but the truth is most of us are only immediately aware of our own thoughts and feelings. When we stand in line or wait in traffic, everyone there is equal, yet we often think of our own needs only, and that causes frustration. How can we attain a character that includes patience? The answer is hidden in a significant amount of effort. The more we learn of God's plan helps us understand God's character and greater understanding leads to a desire to get rid of our old habits, or in other words, to gain more control of our thoughts and actions. There is a hope that we will be more sympathetic to the condition of others and less concerned about our own discomfort. That is progress! 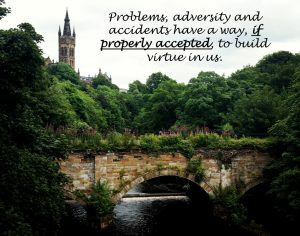 Problems, adversity and accidents have a way, if properly accepted, to build virtue in us. The disagreeable relative or coworker who annoys us can be a tool to help us build patience. Every nuisance, traffic jam, long wait, demanding boss, ache and pain is an opportunity to gain patience. We can grow Christ-like by using all experiences in life. We can rely on scripture in Romans 8:28: "And we know that all things work together for good to them that love God, to them who are the called according to his purpose." A simple way to measure our patience is to consider our faith. We must ask ourselves, "Is my faith strong enough to develop my patience? Can I cheerfully endure and trust the Lord is in control of what may enter the door of my life?" Romans 15:4 supports the thought that patience is associated with hope: "For whatsoever things were written aforetime were written for our learning, that we through patience and comfort of the scriptures might have hope." In the book of 1 Samuel, the story of Saul becoming the king of Israel is recorded. Samuel, the prophet, was upset with Saul for burning an offering to the Lord. In God's arrangement, only the priests might offer sacrifices. The priests were fully consecrated to God and were accepted by Him. Only the priests could offer acceptable sacrifices. All of God's consecrated people—those who now have fully committed themselves to doing God's will—will become kings and assume that role if faithful. But the sacrificing work of the priest is to take place first. Therefore, the sacrificing work of the Church, those consecrated people, must first take place before they are elevated to the office of king that will govern mankind in the future. Like Saul, the Church receives its instruction from a prophet…the mighty Word of God. Will we grow impatient or grow in trust? There are several lessons we can consider from Saul's impatience: Who has control of us…our Lord or others? Hebrews 6:12 tells us, "that ye be not slothful, but followers of them who through faith and patience inherit the promises." It can be difficult to wait on the Lord, but that is our instruction. Complete reliance on the Lord and full obedience to His every requirement is necessary for our proper development. Our Heavenly Father sometimes uses tense situations, as He did with Saul, to try the patience of His followers. Romans 5:3 says, "And not only so, but we glory in tribulations also: knowing that tribulation worketh patience." What a blessing to truly understand that God has the best interest for us at heart at all times! Our experiences, especially the fearful ones, have an outcome that, if properly exercised, will draw us closer to Him and properly develop our character. 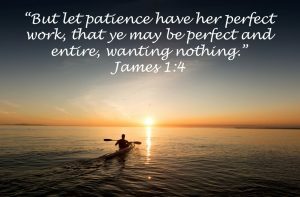 How does patience have "her perfect work" as described in James 1:4? Proverbs 16:32 says, "he who is slow to anger is better than the mighty, and he who rules his spirit, than he who captures a city." If your faith is so strong that you control your will to do that which our Lord directs, you are indeed a mighty one who will be able to rule others. Patience helps us rule ourselves so that we may know how to guide others. This is a lesson that should not be forgotten. Patience is an essential element of character and is a mark of giving as opposed to a mark of taking. We find our daily lives filled with many opportunities that test our patience. The weaknesses in our own lives can be a struggle and if we're not careful, we can project those weaknesses onto others. Patience takes time, practice and concerted effort to acquire. To have gained true patience implies an endurance of injustice in an acceptably joyous manner. Our egos are so easily offended—our competitive spirit says, "You won't get away with that!" True patience indicates a development of heart to accept the wrong and realize it can be used to further develop positive character. The result would be as the scripture reveals "to want nothing," or as the New American Standard Version puts it, "lacking nothing." Patience will have its perfect work to make you perfect and complete, lacking nothing. The acquiring of patient endurance is developed slowly and must over time complete its goal. It certainly is a challenge. The Lord knows this and stands right there with us at all times and places to provide encouragement. Co lossians 1:9-12 tells us, "ask God to give you complete knowledge of His will and to give you spiritual wisdom and understanding. Then the way you live will always honor and please the Lord, and your lives will produce every kind of good fruit. All the while, you will grow as you learn to know God better and better. We also pray that you will be strengthened with all His glorious power so you will have all the endurance and patience you need. May you be filled with joy, always thanking the Father. 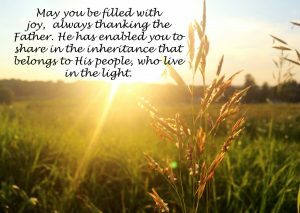 He has enabled you to share in the inheritance that belongs to His people, who live in the light."